In the Coretta Scott King suite on the second floor of the Hyatt Regency, the 59th mayor of Atlanta was doing something he’s never enjoyed nor been particularly good at. He was waiting. Waiting—and this was the worst part—to be summoned. Downstairs, the supporters of Keisha Lance Bottoms, his heir apparent, were also waiting, but at least they were sipping $11 well drinks and, when the DJ played the right song, doing the Wobble. Not that the mayor drinks. Or wobbles. He’d taken off his navy blue suit jacket and was sitting at the chair positioned at the center of the rectangular table, itself positioned at the center of the suite. There were TVs switched on at both ends of the room, and his friends and supporters and staffers clustered about them, waiting for the results to come in. This being Fulton County, where election returns take so long you’d think they were counting votes on an abacus, there was down time. Someone put a cold can of Coca-Cola on the table in front of the mayor, and he popped it open. He pulled out his phone and started scrolling. A mayor of a big city has a gravitational force. The closer you get, the stronger the pull, until you find yourself in an orbit, and the next thing you know, you’re measuring your path against those of all the other satellites. Who’s drawing closer? Who’s pulling away? 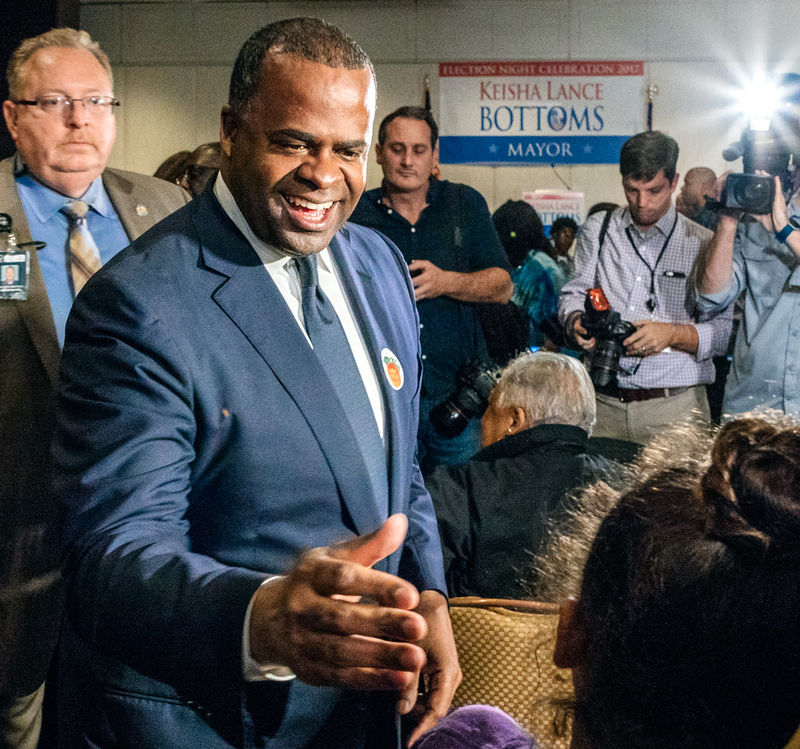 Kasim Reed had spent the last 2,865 days of his administration taking a tactical pleasure in the jockeying around him. From the outside, it may appear enervatingly chaotic—the backbiting, the scrambling for his audience and approval—but to a certain personality type, it can be motivating. It can drive them to excellence. As well as to exhaustion. Talk to those who worked for Reed for most or even all of his years in office, and they’ll mention the vacations they plan to take and the lost hours of sleep they plan to catch up on when he leaves in January. You’d search for a while before you found Reed veterans who weren’t quietly relieved their boss couldn’t run for four more years. 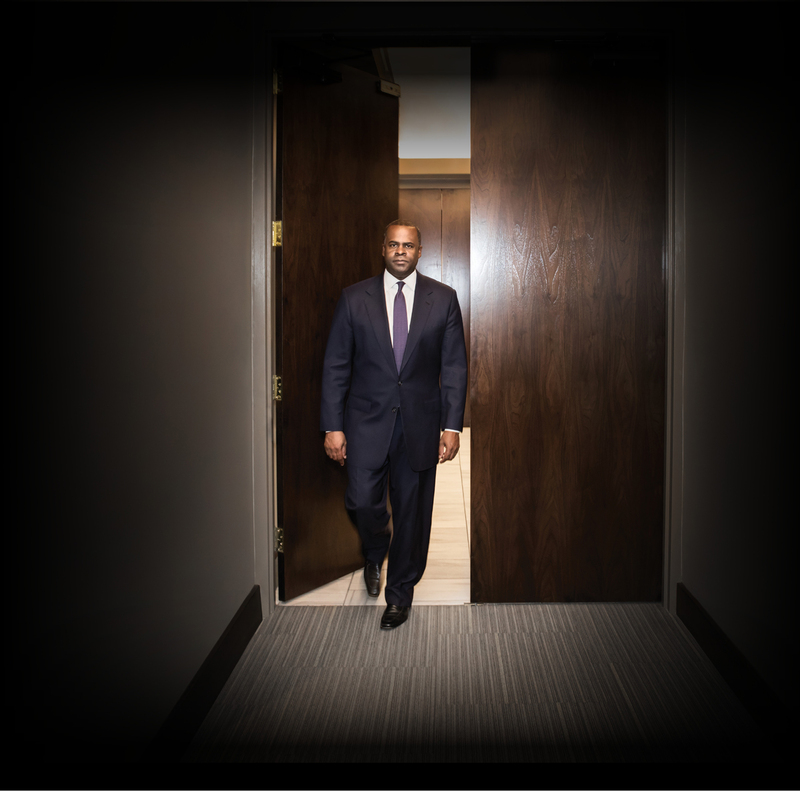 The fact of the matter is (“the fact of the matter” being one of the mayor’s favorite turns of phrase, no doubt because it telegraphs that what’s to come is simply irrefutable) no one ever could outwork Kasim Reed. Which brings up the opposing force, also called term limits. The mayor of Atlanta can serve no more than two successive terms, though she or he is free to run again after leaving office for at least one term. Maynard Jackson famously did that. But today, most would agree that Jackson’s third term was anticlimactic, which it was probably doomed to be, since his first two terms were propelled in part by the moral and political force that came with being the city’s first black mayor. Jackson made the city—and, most notably, the airport—the kind of place where black contractors and vendors and professionals were not just tolerated; they were encouraged. Jackson made room for them—by statute but also by fiat. He changed the culture of a city. That’s a tough act to follow, even if it’s your own. When Mike Bloomberg was mayor of New York City, a clock in City Hall counted backward the time left in office, down to the second. Reed never needed a clock. He’s known how much time he had left since he was sworn in on January 4, 2010. When he was a teenager, Reed began mapping out his life on three-by-five cards. Go to Howard. Then law school. Run for state representative. Win. Run for state senator. Win. Each accomplishment was a stepping stone toward the ultimate goal: becoming mayor of Atlanta. So, if you’re one of the people who soured on Reed during the past eight years (and they are legion, and include those who once called him friend), who find him too autocratic, a know-it-all, an egomaniac, consider this: He started planning for this job when he was in eighth grade. No, the real surprise would be if he cared what you thought. Not that it hasn’t taken a toll. A few months before the general election, in front of a crowd of a hundred or so Atlantans, he was asked about what life will look like for him when he’s no longer mayor. He told the story about the three-by-five cards. “Obviously, I’m a damaged person for having executed on that plan, so I’m looking forward to just walking around,” he said. To read those words, it sounds like a joke, except he wasn’t smiling when he said it. In the suite tonight were 20 or so guests of the mayor. New arrivals were carefully vetted by his security detail. Reed’s brother, Tracy, was there, along with Tracy’s wife. So was John Ahmann, the longtime ally of Reed who heads up the Westside Future Fund, the privately funded entity trying to resurrect the neighborhoods abutting the new Mercedes-Benz Stadium. Some of the other guests: Robert Ashe III, the chair of the MARTA board; Amy Phuong, the parks and recreation commissioner; Yvonne Cowser Yancy, commissioner of human resources; Mack Wilbourn, the airport franchisee who once hosted a fundraiser for President Obama at his house; Jeff Dickerson, the public relations consultant who’s a frequent guest on The Georgia Gang; Steve Brock, president of Brock Built homes; Michael Thrasher, founder of Thrasher Contracting & Trucking. The mood was subdued, as if no one seemed particularly sure how to act. Was this a happy occasion? A sad one? Even if Bottoms advanced, as she was expected to, it didn’t change the fact that Reed, whom they had worked for or supported for eight years, and sometimes more, was a short-timer. 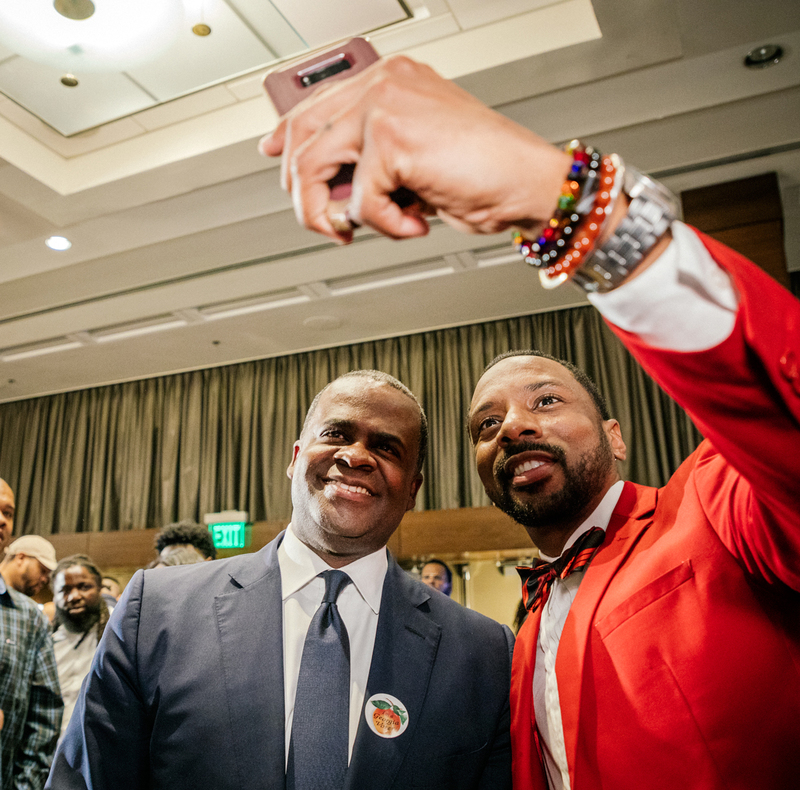 Mayor Kasim Reed introduced Keisha Lance Bottoms the night of the general election. Bottoms would go on to beat Mary Norwood by the thinnest of margins (though Norwood would demand a recount). Before midnight, Bottoms herself dropped by. She was on her way down to the ballroom to address her supporters. By now, the news was all but official: Bottoms would face off against Mary Norwood in four weeks. (Eight years ago, Norwood came just a few thousand votes short of winning the mayor’s seat outright in the general election, only to have Reed slip past her in the runoff, winning by 714 votes.) Everyone in the room stood and applauded when Bottoms entered. Bottoms’s eight years on Atlanta’s city council overlapped precisely with the mayor’s two terms. In 2015, she was named executive director of the Atlanta and Fulton County Recreation Authority. By then—or since then, it’s not clear—Reed had settled on her as his designated successor. During the coming weeks leading up to the runoff, Bottoms would find out just how far the mayor’s support would take her, but right now, she was here to thank everyone in the room for their help. There was more applause, and she laughed nervously and said if she cried, it would wreak havoc on her fake eyelashes. She ducked out. A few minutes later, Reed slipped his jacket back on, straightened his tie in the mirror, exited the room, took the elevator, then an escalator, strode past the camera risers in the Regency ballroom, and introduced the woman who would succeed him in the only job he’s ever really wanted. Reed fielded a few questions, and all seemed fine, until one reporter asked him to comment on the news that morning that Ceasar Mitchell, the city council president, would endorse Norwood for mayor in the runoff against Bottoms. Just a few months earlier, the safe money had been on Norwood squaring off against Mitchell in the runoff. It was supposed to be Mitchell’s turn, after all. Eight years earlier, he’d sought out former Ambassador Andrew Young’s endorsement for mayor, but Young had already committed to Reed, and so, as Young tells it, the ambassador encouraged Mitchell to run for council president instead. Mitchell agreed, and in 2017, true to his word, Young endorsed Mitchell for mayor. Fat lot of good it did Mitchell. Young may be a pastor, adviser to presidents, a civil rights icon, a former mayor himself, but his endorsement of Mitchell—rolled out during a brief lovefest at Paschal’s—was no match for Reed, who took visceral pleasure in using his bully pulpit to slag Mitchell. The list of Atlantans on Reed’s shitlist, and there really is no better word for it, is a long one—Egbert Perry (developer), Shirley Franklin (former mayor), William Perry (Georgia Ethics Watchdogs), Bill Torpy (Atlanta Journal-Constitution columnist), Vincent Fort (state senator; failed mayoral candidate), Dale Russell (Fox 5 investigative reporter), Miguel Southwell (former airport chief, fired by Reed), maybe me after he reads this story—but at the top, arguably, is Mitchell. Why? Young told me that he believes it started back when the two men were teenagers, growing up minutes from each other in southwest Atlanta. Is Atlanta really that small of a town? Yes, it is. Now, back to that question about Mitchell’s endorsement. Here’s something a different politician might have said: We’re here to talk about affordable housing, about how today’s announcement is delivering on a promise to make the most desirable neighborhoods in Atlanta affordable for all. There’s nothing more important. Or, another politician: It’s a political season. The council president is free to endorse whomever he wants, but I’m confident the voters of Atlanta will see that his decision is motivated more by resentment toward me and disappointment at his sixth-place finish in the general election than out of any real belief that Mary Norwood will be the best mayor for all Atlantans. Endorsements should be just that—endorsements. Not settling grudges. For precisely four seconds, there was silence in the room. Not even the click of a camera shutter. There are a lot of things that Reed will undoubtedly miss about being mayor—his security detail, his city-issued Yukon Denali, his courtiers, his spotlight, his power to shape an entire city—but these awkward silences . . . they are something else altogether. Because for him, they’re not awkward. The best thing that ever happened to Reed as mayor occurred just after he was sworn in on his first day. He’d taken a MARTA train from the Civic Center to City Hall—he paid more attention to optics in the beginning than toward the end—where the finance people were waiting for him. For his signature, to be precise. Without signing a stack of tax anticipation notes, Reed would effectively be the boss of a company that couldn’t make payroll. For the young mayor, just 40, it was a “crystallizing” moment. “I wanted to know why we were in that shape,” he told me in his office on the Tuesday after Thanksgiving. “The reason we were in that shape is that [the city] had approved bloated pension packages and had made them retroactive. So, it was like that Mission: Impossible scene with the fuse. It was absorbing 18 percent of our cash.” The need for pension reform wasn’t a surprise to Reed; it had been a fraught topic on the campaign trail. But the urgency of the situation, laid bare by his first official act as mayor, focused him. The Atlanta outside City Hall wasn’t doing any better. Office vacancy rates were at 18 percent and climbing. There was so much empty office space that experts figured it would take 10 years to fill it all—and that’s with no more new construction coming online. Remember how we used to worry Charlotte would overtake us? One of Reed’s favorite books is by a British educator named Michael Barber, who served in former Prime Minister Tony Blair’s government in the early 21st century. Called Instruction to Deliver, the book explores how a politician might bridge the daunting gap between a promise made and a promise kept. Barber’s title under Blair was “chief adviser on delivery.” Across 436 wonky pages, Barber explores the concrete steps that the technocrats under Blair took to improve government services on the most granular level, from identifying low-performing train operators to measuring hospital wait times. It’s not easy reading, but for Reed, the rare politician who knows every big picture is simply a collection of small ones, it became a guidestar for his administration. Weekly department head meetings, where Atlanta commissioners and cabinet members would give status updates on projects and priorities (and where Reed would occasionally dress them down), mirrored the periodic “stock-takes” that Barber describes Blair hosting. Although Reed had won by just 714 votes, he was still early in his term. It was time to test the waters. To ignore pension reform was not an option; even if the city somehow had still managed to avoid bankruptcy by the time he was up for reelection, to let it go unaddressed would not only violate a pledge he’d made on the campaign trail, it would hobble him from doing other things he’d promised, like opening the city recreation centers that budget cuts brought on by the Great Recession had left closed. Ultimately, the solution that the council approved unanimously in 2011 was a hybrid of several proposals from the mayor and from council members that included a 401(k)-like plan, increased contributions from city employees, a longer vesting time, and a higher retirement age. Everyone took a piece of the credit, because everyone deserved a piece. Though “joy” was not a word I heard anyone but Reed use in describing life at City Hall under him, it’s also true that those in his inner circle, especially during the early days, felt a sense of mission and purpose that was unlike anything they’d ever experienced before. As a boss, Reed’s philosophy was simple: Hire smart people, give them autonomy, and always have their backs. In exchange, he pushed them. Hard. “He bets on people—and potential,” said Duriya Farooqui, who was a rare holdover from the administration of Reed’s predecessor, Shirley Franklin. Since 2016, Farooqui has been executive director of the Atlanta Committee for Progress, a consortium of local business and civic leaders that acts as a kind of sounding board for the mayor. But in 2010, she was 33, deputy COO under Peter Aman, and assigned to negotiate with Delta on wrapping up the long-delayed international terminal. “When I think about the initiatives and ambitions that the mayor had for the city that I was empowered to execute,” Farooqui said, “would I have given myself that charge if I was in his place at the time? Hell no.” In 2011, after COO Peter Aman left, Reed promoted Farooqui, and before she herself left in 2014, she negotiated for the city in the Mercedes-Benz Stadium discussions. Reed and his team delivered results: The city’s credit rating is now AA+, one step below the highest ranking. He unloaded city-owned parcels—City Hall East, Underground Atlanta, Fort McPherson, the Civic Center, Turner Field—that were more trouble than they were worth, prompting some to label him the “real estate mayor.” He brokered a deal for the Falcons to build a new stadium. He partnered with Republican Governor Nathan Deal, a relationship that expedited the deepening of the Savannah port and made Reed more welcome in the city-hostile halls of the General Assembly. Reed reopened every recreation center in the city, two-thirds of which had been shuttered when he took office, cleverly rebranding them as “Centers of Hope.” He championed LGBTQ rights, the BeltLine, sustainability, and mass transit. Under Reed, the police department hired its 2,000th officer, a goal articulated but not achieved by his two immediate predecessors. (It has since dipped back below that number.) All of this he did without raising property taxes while also building up cash reserves (as city law dictates he must do) to almost $200 million. Undoubtedly, he was helped along the way by national trends of falling crime rates and surging employment plus a generational renaissance of cities across the country, particularly in the Sun Belt, but Reed, a man who keeps careful score, does not need to grade his accomplishments on a curve. There were losses. He campaigned tirelessly for the first T-SPLOST in 2012, a one percent sales tax referendum that would have funded $7.2 billion in transportation improvements across 10 counties. It failed miserably. And it was under Reed’s watch that the Braves negotiated with Cobb County in secret before announcing the franchise would build a new stadium there. Atlanta’s rapid growth—$3.5 billion in new construction permits in 2016—has, paradoxically, focused a starker light on its failures. Four out of five black children in Atlanta grow up in impoverished neighborhoods, while just one in 20 white children do. The BeltLine has been a relentless engine for intown growth but increasingly at a cost to the homeowners and renters whose historic neighborhoods it transects. Unemployment rates for black Atlantans are three times that of white Atlantans. Atlanta remains the most economically divided city in the nation. The average credit score for a nonwhite Atlantan is 560—subprime—which makes them vulnerable to vulture lenders. To be black in Atlanta is, statistically speaking, to be poor in Atlanta. This phenomenon is far from unique to the administration of Kasim Reed, but as the percentage of white Atlantans begins to creep back to levels not seen since the early 1970s, and as the median price of a home hits record highs, the “Atlanta Way” has begun to look like the way to nowhere special. If Reed ever was inclined to conceal his arrogance, he pretty much abandoned that pretense during his last year. In July, both WSB-TV and Fox 5 aired stories on an April trip that 10 city employees, including Reed, took to South Africa. Six of the plane tickets were business class, and the total airfare was almost $81,000. (After the reports, Reed’s office said that an unnamed NGO would reimburse the difference between the cost of business class and coach.) Similarly, 12 days before the general election, the AJC reported that leftover money in a political committee funded by local businesses to drum up support for the 2015 transit referendum went to help fund the campaigns of seven of Reed’s allies on city council. A “slush fund,” one mayoral candidate called it. In February, in one of the most passive-aggressive acts in Atlanta political history, Reed called a press conference to announce the release of 1.5 million pages of City Hall documents that his administration had turned over to federal investigators. Dozens of the 400 banker boxes served as a backdrop for the photo op. “What I wasn’t going to allow to happen was for y’all to question my commitment to sunshine,” he said. Thousands of pages were printed in a font so small they were illegible. Reporters spent hours randomly riffling through the documents. If that was Reed’s idea of sunshine, everyone left with melanoma. Adrean, the outgoing city councilmember, told me that it’s the job of the mayor to address the calcified and corrosive culture of how procurement is done at City Hall. “So many of our contracts are legacy contracts that go on for 25 years. There’s so little disclosure of who these people are. We’re a public company. We’re funded by taxpayer dollars, and yet, the majority of our vendors are private businesses who don’t have the disclosure [rules] that public companies do. The 2017 campaign for mayor lacked the urgency and energy of eight years ago, thanks in part to the preposterous number of candidates (13, at one point) running to succeed Reed. Debates felt less like robust exchanges than tedious table readings from an ensemble cast that had grown weary of one another. Up until late summer, the safe money had been on Mitchell to make the runoff against Norwood, who was back again, undaunted eight years after her razor-thin loss to Reed. But Mitchell was languishing. Meanwhile, Cathy Woolard was finding her voice and competing with Aman, Reed’s former COO. And Bottoms, the sole black female candidate in a city where black women are the largest voting demographic, was breaking free of the pack, at least according to a poll in early October. By the time Reed went on V-103’s morning show to announce his endorsement on October 11, Bottoms had found momentum. Cameron didn’t follow up, but Reed didn’t need him to; the mayor had done what he’d come to do. He’d given a public (if not full-throated) endorsement in the race to succeed him, and he’d also launched a warning shot that Bottoms’s opponents should be careful what they say about “this black woman.” Reed’s comments were a kind of preemptive strike. From now on, anyone who looked at Bottoms—at, for example, the donations from airport contractors that were helping fuel her campaign as they had Reed’s before—and concluded, or even worried, that a Bottoms administration would be merely an extension of his own, and that she was in his debt or, worse, in his thrall . . . well, to have those concerns meant you were sexist. Maybe even racist. As the December 5 runoff approached, though, and with Bottoms catching flak for her association with Reed, the mayor eased up. One week before the election, he spoke with me for an hour in his office. The “losers” comment had clearly done Bottoms no favors. Still, he didn’t like muzzling himself. Simply put, Reed explained, if Atlantans disapproved of his combative approach, then his approval numbers wouldn’t be so high. “If there was something showing up in our data that said that people did not like this in our focus groups, trust me, I’m a decent politician. I would adjust,” he said. The metrics justified the means. Not long after the next mayor is inaugurated, Reed and his family will board a flight for the Bahamas. “I’m going to have a month or two months where I’m going to be pretty much unrecognizable. And I want to learn Spanish.” After that? He expects he’ll join a university or a think tank before he maps out his next move. President Donald Trump’s victory scuttled any plans he might have had for a job in a Hillary Clinton administration, so the man with the five-year plans is feeling . . . unsettled. I asked if he would consider running for mayor again. “I don’t know,” he said. But he seemed eager to put to rest any thought that he’d play a behind-the-scenes role in a Bottoms administration. “I really have a strong ‘leave’ personality. I never wanted to be the guy who went back to his high school with his varsity jacket on. If you look at my career, I haven’t gone back. This article originally appeared in our January 2018 issue.